St. Louis Cardinals top pitching prospect Michael Wacha will be called upon to make his big league debut on Thursday, May 30 against the Kansas City Royals. A first-round (19th overall) draft pick in the 2012 MLB Amateur Draft out of Texas A&M University, Wacha has quickly ascended through the St. Louis organization, starting the 2013 season at Triple-A Memphis following an impressive spring training. In nine starts for Memphis this season, Wacha has posted a 4-0 record and 2.05 ERA, along with a 34/15 strikeout to walk ratio in 52.2 innings of work. In his most recent start on May 21, Wacha worked five innings and surrendered two runs in a 3-10 loss to the Salt Lake Bees (Triple-A affiliate of the Angels). 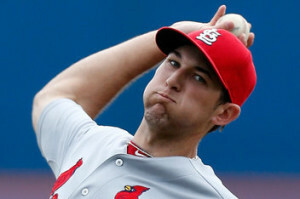 Wacha has a quick, strong arm, which allows him to give electric movement to his mid-90s fastball. Wacha has an aggressive approach and a commanding mound presence, along with an advanced pitch arsenal and plus control which have allowed the young hurler to progress quickly through the St. Louis system. St. Louis general manager John Mozeliak decided that Wacha was the club’s best option to help an injured starting rotation, as Wacha has progressed quickly throughout the minors since being drafted last season. On his expectations for Wacha’s debut, Mozeliak had this to say: “We just have to manage expectations a little bit,” Mozeliak said before Tuesday night’s game in Kansas City. “He’s a year removed from college and he’s thrust into a very competitive division with a lot of expectations being put on him, and I don’t know how fair that’s going to be.